I haven’t cared for a character this much since my attachment to the phenomenal protagonist in Kate Atkinson’s Life After Life. 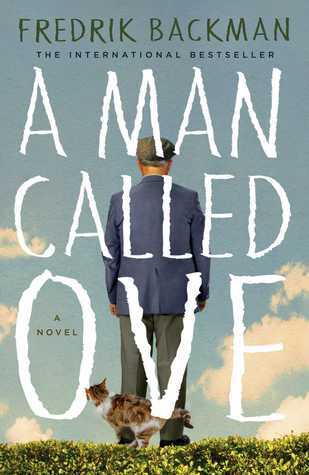 Closing the novel A Man Called Ove hurt my heart. I dreaded this book’s last page because it would mean that I would have to leave the story. I may even have reread sections of the novel because I just couldn’t let go. Why the melodrama in my reading life, you might ask? Simply put, it was because I fell for this main character with a resounding thump. There was no turning back – I was crazy about him from the moment we met. I wanted to throw my arms around him every other page. He is, in my humble opinion, a literary darling. He’s also a miserable grouch. Let me introduce you to Ove. This is a man who redefines the word curmudgeon. This is a man who will stand in his door and bellow at children to get off of his damned lawn. He yells at a stray cat to get away from him. He patrols the garbage area of his housing complex. He’s still steaming because he was ousted as chairman of his neighborhood resident’s association. And doggone it, this is a man who just wants everyone to bloody well leave him alone so he can end his life in peace. Yes, you read that right – the poor bloke wants to join his beloved wife in the afterlife, but all of these confounded interlopers keep interrupting. The nerve. The audacity. The inconvenience! Ove’s world is well ordered. He has a schedule. He knows the date and time of the last oil change on his Saab. He has kitchen countertops that are perfectly maintained. He can fix anything. He can build anything. He’s also supremely bored. Having been forced into retirement before he was good and ready, Ove becomes a menace to his neighborhood because of his chronic need for order. He drives people insane with his desire to keep busy, and to keep autos out of the no-drive section of the complex. Tough job, policing a neighborhood when no one appreciates you. As you can imagine, all of this just fans the flames of Ove’s dark mood. He’s not exactly fun to be around, and this drives him to wish to end it all. Better to be with someone who loves you for you, rather than hanging back with droves of people who just don’t understand. Best to leave. Right? The worst of Ove’s nightmares is the new family that just moved in next door. This moronic couple not only talks endlessly, but they’re far too cheerful, and they also flattened his damned mailbox when they tried to back in their U-Haul. Ove had to back it in for them, which he did while offering an unflinching assessment of their gross incompetence. And to top it off, this couple has two young girls who know nothing of quiet or personal space. A boisterous husband and wife, AND children? Life just got really annoying for Ove. Or… did it? “Read!” she demands again, climbing on the bench in the waiting room with surprising agility. “Once upon a time there was a little train,” reads Ove, with all the enthusiasm of someone reciting a tax statement…. Now don’t do what I did when you read this summary, and assume that it’s simply another story of a grumpy man who goes soft in the end. This book is much more. When you’re finished with A Man Called Ove, you will know everything that made Ove who he is. You will understand every emotional outburst, every tear, and every clenched fist. You will know of his pain, his triumph, and his deepest love. I must also warn you that for every moment that you laugh out loud during this story, you may shed tears in equal measure. I guess I’ll stop gushing now. Needless to say, 5 stars for A Man Called Ove. Please do yourself the favor of picking up a copy. Even if you too are a self-proclaimed stick-in-the-mud like Ove, I promise that you won’t be able to resist him. What an amazing book! I found your site through Pinterest and probably never would have seen this book if not for Literary Hoarders. I have started to read only books that you have rated 4 or higher and my reading has become much more enjoyable. I look forward to seeing what books are coming up next in your (my) queue! Thank you so much for visiting, Terrie! So happy you enjoyed A Man Called Ove. We’re very flattered that you’re reading our 4+ star rated books – we promise to keep them coming!